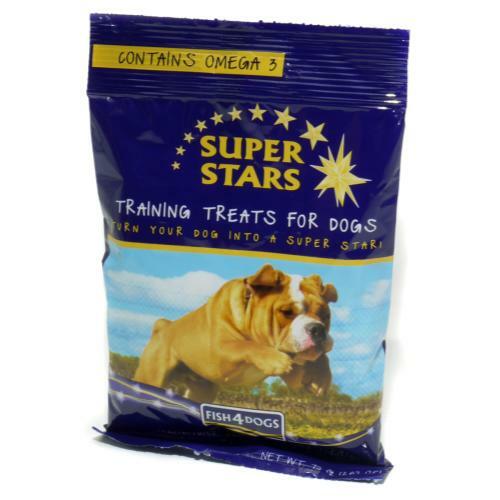 Fish4dogs Star Training Treats 50gare small, natural rewards packed with fish and infused with Salmon Oil . Smelly enough to catch your dog’s attention, tasty enough to have them come back for more and small enough to be used often during training. Trace Elements: Zinc Chelate of Amino Acid Hydrate 660mg, Copper Chelate of Amino Acid Hydrate 88mg, Calcium Iodate Anhydrous 2.75mg, Antioxidants (Stabilised with Rosemary and Tocopherol-rich Extracts).